In a deep Blue shrouded Japan's landscape in this picture. The false-color satellite image shows the Region around Osaka and Kyoto in the Western part of Honshu, the main island of Japan. 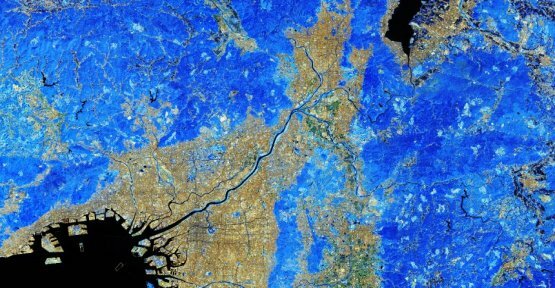 The area, Kansai, is in conjunction with the city of Kobe (left below) with more than 17 million inhabitants is one of the most densely populated regions of the earth. The port of Osaka with the huge Bay, the Yodo-river flows, is not the only body of water in the image. To the North-East of Kyoto (above right) is of lake Biwa in the Shiga Prefecture. He is with an area of more than 670 square kilometers, the largest freshwater lake in the country. The picturesque Kyoto is regarded as one of the cultural centers of the country. Numerous temples and Shinto shrines in the historic centre of the city, witnesses of its long history, including the extensive grounds of the Fushimi Inari-Taisha Shrine, and he belongs to the Unesco world heritage site. The area is also famous for its culinary achievements. As a precursor to court the popular Sushi comes from here. In the preparation of the expensive specialty Funazushi fish from the Biwa is fermented-the lake with rice and salt in barrels for up to a year, and preserved. This method of preservation has been used for over a Thousand years, not only in Japan. Probably it was first developed on the Mekong river in China and probably in Parts of Southeast Asia. Funazushi is, however, something special in the taste. The rice that is served along with the rice wine Sake, has a very intense smell. In addition, it tastes strongly acid. Also in Osaka, a lot revolves around good food. The multi-cultural restaurant scene is famous for its good street food and the "Kappo"cuisine. This little formal Restaurants bring together the guests and the chef. The meal is prepared right in front of the eyes of the guests, sometimes for a nice chat. Of all the white Sentinel-2B satellite, which has made the recording, of course nothing. In the false-color image areas are colored, which deviate from the natural color spectrum to make certain data visible have been targeted. The recording shows clear differences in the landscape surface. according to the researchers of the European space Agency Esa can more easily distinguish land masses from water or the haze of clouds. In this case, the Vegetation in bright blue is displayed, the building is displayed in yellow-red tones.